Imagine your new house in a wooded setting. Now look three to five years into the future and notice some of the trees on the perimeter of that wooded area are starting to look sickly, branches are dying back or a whole tree is dead. This is not the scene you pictured those few years ago. What happened? Why are the trees dying? What disease is attacking your trees? What should you spray on the trees? Who do you call? How much is this going to cost? Or imagine this. You've decided to get off the couch and tackle some of those landscaping and home improvement projects you've seen everybody else doing on television. So you put in a new sidewalk, a new retaining wall, a new deck, new landscaping, or a new whatever the project was. Now look three to five years into the future and notice some of the old trees near the new construction are starting to look sickly, branches are dying back or a whole tree is dead . What happened? Why are the trees dying? What disease is attacking your trees? What should you spray on the trees? Who do you call? How much is this going to cost? 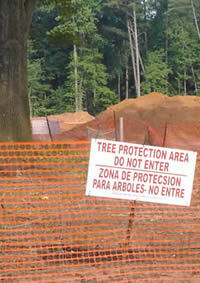 These questions could have been avoided if the valuable trees had been protected during all of the construction activities. The valuable trees are the ones that you place a value on. First, understand that a tree's roots develop and survive where there is adequate oxygen and moisture. Most active tree roots are in the top 3 feet of soil with the majority in the top 12 inches. And the roots typically grow outward to about three times the branch spread. So when roots are cut, extra soil is placed over them, constant vehicle traffic compacts the soil around them, or chemicals are spilled near them, the tree becomes stressed as it tries to adapt to the change in the root environment. Outward symptoms of this stress may not become apparent for a few years. Usually younger trees will adapt to changes more successfully than older trees and some species will adapt more successfully than others. Typically, root damage is not as evident as an obviously visible wound to the trunk or branches. Nonetheless, if protection measures are not taken around a valuable tree it may succumb to construction activity induced stress and become more of a liability than the valuable asset you had envisioned. The TPZ is an area around the tree where construction and equipment use is prohibited. At a minimum it should be encompass a radius of at least 1.25 feet for each inch of trunk diameter. For example, a tree with an eight inch diameter trunk (diameter measured at 4.5 feet above the ground) should have protection all around in at least a ten foot radius from the trunk. There is no conversion of inches to feet involved here, just a simple multiplication of the number.